If I was asked what I’d plant in my garden before anything else, it would be a selection of fresh herbs and then tomatoes. Nothing does it for me quite like fresh herbs. Basil. Dill. Mint. Parsley. Oregano. Sage. Thyme. Rosemary. Tarragon. The list goes on. Fresh herbs transform nearly everything you put them in, be it a mayonnaise, like the one below, a soup, a stew, a salad, or even ice cream! Young fresh herbs and spring onions from our vegetable garden. As winter hared into ‘sprummer’ here, the tiny basil and dill seedlings bypassed the awkward rangy stage and turned into lovely young things almost overnight. The mint and chives, on the other hand, weathered the few cold nights, as did all the hardier woody herbs like rosemary and thyme. 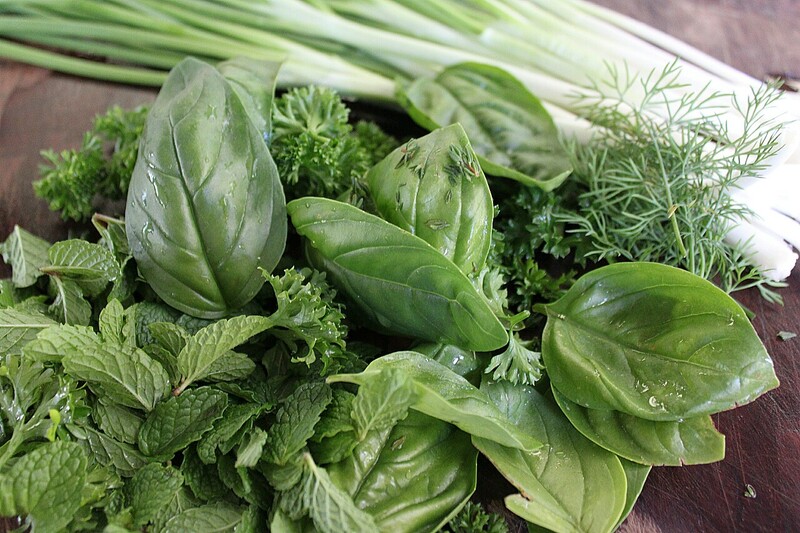 Fresh fragrant herbs can be grown as companion plants with a variety of vegetables to deter horrid insects, which we do; they can be grown in pots on your veranda; they can be grown on a windowsill in your kitchen. I urge you, please, just grow them. They will change your cooking life. As I promised in my last post on nasturtium capers, below is my favorite recipe for potato salad, inspired by Sarah Raven’s Garden Cookbook‘s recipe, Potato Salad with Capers & Anchovies. It’s a terrific complement to grilled meat or fish, along with a simple green salad. We often eat it just with a salad. 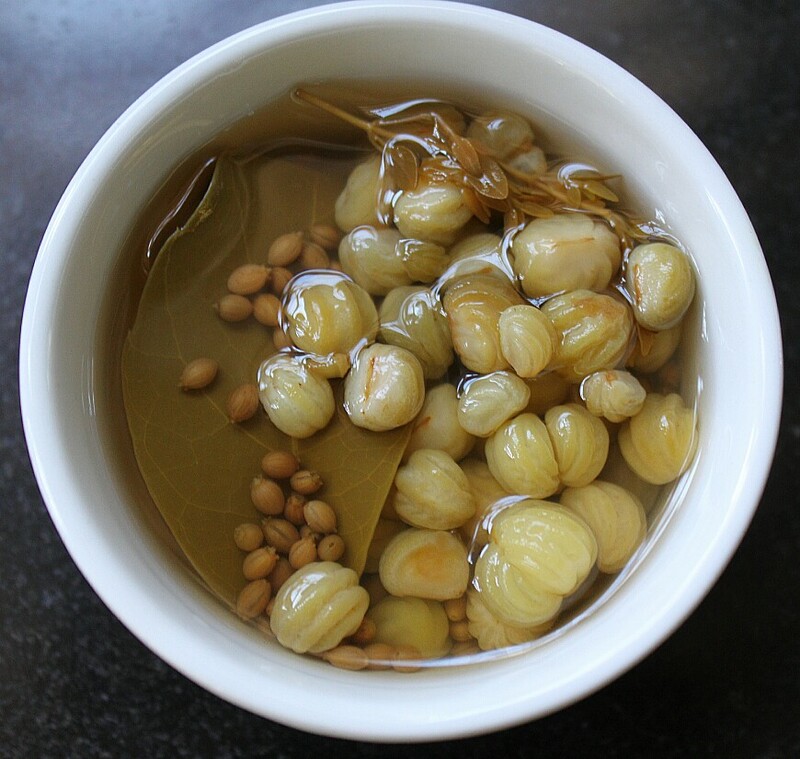 Nasturtium capers: a recipe that was later featured in America’s The Cook’s Cook magazine. 1 heaped cup fresh herbs, roughly chopped. I used mint, dill, basil, parsley, chives and thyme. Optional: Nasturtium/ chive flowers for garnish. Five-minute homemade mayonnaise (click on this link for the recipe). 1. Cook the new potatoes in salted boiling water, about 10-12 minutes. Watch them carefully: they should be cooked but not breaking apart. Drain in a colander and then run under cold water to cool. 2. Make the Five-minute homemade mayonnaise (click the link for method), mixing in the yogurt, and salt and pepper to taste. 3. Gently combine the mayonnaise with the fresh herbs, reserving a tablespoon of herbs for garnish. 4. 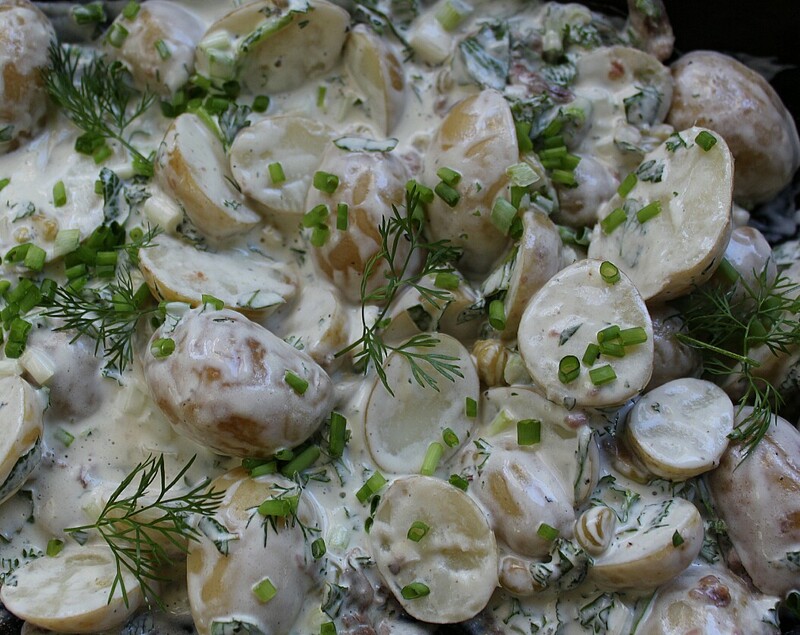 Combine the new potatoes with the capers and anchovies, and then mix in the herb mayonnaise. 5. Garnish with remaining fresh herbs and green ends of the spring onions. New Potato Salad with Fresh Herbs & Nasturtium Capers. A Hot & Wild Panforte from the Hot & Wild Zambezi Valley! Oh my!! Your potato salad recipe is a wonderful culmination of all the delicious ideas you’ve been giving us along the way. Gone is the stodgy braai accompaniment….this salad has taken on a fresh new look and taste! Yum. Can’t wait to make it and try it. My mouth is watering! Can’t wait to try it! Love the idea of you capering with nasturtiums on the edge of the Zambezi – what could be better?